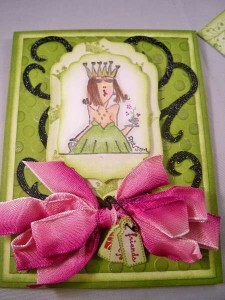 This card was made for a friend , her niece was in a pageant and she need a special card for her in lime green ( her fav color ),the pictures here do not pic up all the glitter and shimmer that I added to this card,I modified my Wine Princess stamp ,I masked off the wine glass and in its place after the image was stamped I added a bouquet of flowers for her to hold . 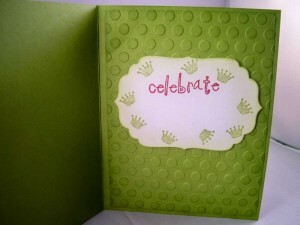 I love to think outside the box and use what I have . 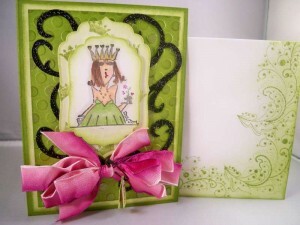 What a fun beautiful card! 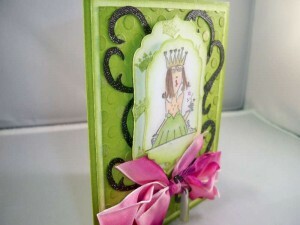 The detail on the card is great with the embossing folder and dies used, the bow is wow, and the little tags pinned to the bow. 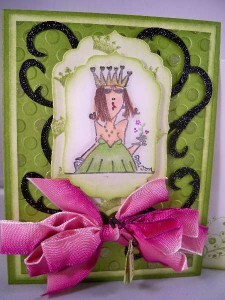 You did great at adapting the wine princess stamp. The niece will love it!